This time, we were on our own. We got a rental car after landing and we were on our way. We stayed at three different places over the 6 day trip and got to see and experience things that were absolutely mind blowing. I snapped 719 photos total and present a selection of those below, along with some words. Our first stop was the Dream Valley Jungle Resort. We only stayed there one night, but the scenery and accommodations were awesome! The next morning, we came across La Cocina. A small restaurant on the side of the road. We hadn’t eaten breakfast yet and remembered passing this place last time we were in Belize and saw a lot of people eating there. We stopped and we are very happy that we did! We actually went back again for breakfast a couple days later too! We stayed at Better In Belize Ecovillage, a 132 acre development in the middle of the jungle, for 3 nights. Jorge and his family took care of us and showed us around the land. For Mother’s Day, Jorge took us out on the Mopan River to show us around, to have lunch on the river, and to visit a waterfall that we heard was gorgeous. We pulled the boat into an alcove that looking like nothing more than a big mound of sand. We tied the boat to a tree and got everyone out of the boat. Jorge said to be careful because it was slippery when we were getting out of the boat. Well, the big mound of sand was really a gigantic calcium deposit from the natural spring that was running down the side of the mountain into the river. It was absolutely BEAUTIFUL!!!!! The water was crystal clear with tiny craw fish in each of the “ponds” that would nibble at your toes if you let your feet sit for a while. The next stop was the waterfall. 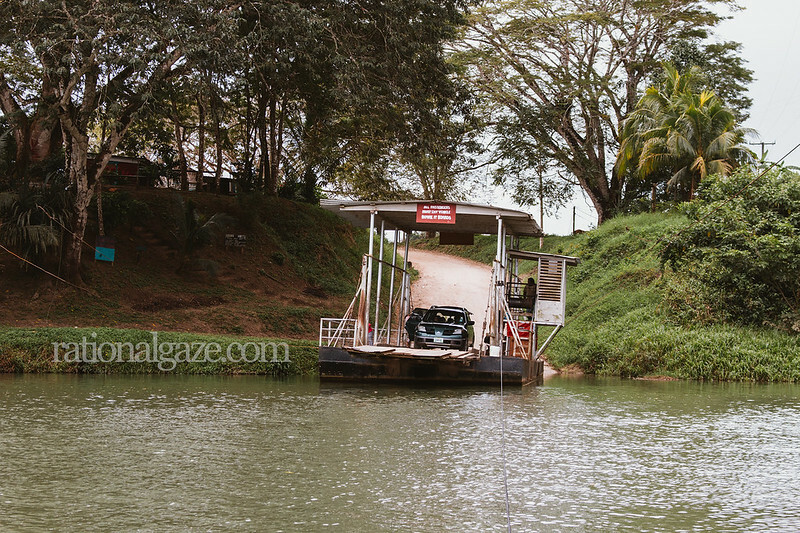 We had to park the boat in another alcove and hike a ways through the jungle to get to it. The waterfall emptied into a 12 foot hole. You could swim about half way and there was a sand bar that allowed you to stand up. You could also swim over to the waterfall and step yourself onto the end of the rocks right under the waterfall for an awesome massage. One of the days we used to visit the open air market in San Ignacio as well as stop back in Spanish Lookout. To our surprise, there were student from Northern Michigan University at the open air market teaching the locals about how many servings of fruit that need per day! I have never really done much street photography, but the open air market sure allowed for me to take a stab at it. We hit up Western Dairies for some ice cream before heading over to Chicken Express for lunch. We also went back to the self-sustaining farm that we stayed at the first time we went to Belize where the girls got to hold a 2 day old turkey! On our last day, we hadn’t planned on visiting Xunantunich. As we passed the entrance, I made a spur of the moment decision and turned around to have a visit. One of the better decision that I have made in my life, that’s for damn sure! Looking West from the top of El Castillo. That’s Guatemala. If you know what that is below, let me know. I caught it as we were walking out of the zoo. Our very last stop was the bed and breakfast that we stayed at our last night. It absolutely sucked! NEVER EVER EVER EVER EVER stay at Beck’s Bed & Breakfast in Crooked Tree, Belize. The only good thing to come of it was the fact that we were introduced to cashew trees!!! This literally blew my mind. I never knew the cashew grew on the outside of the fruit (cashew apple). If you ever get a chance to grace the presence of a cashew tree during harvest time, you will be in awe!!! The cashew apple is something that will take your breath away. It’s high in iron, but the taste of the thing is pure glory in your mouth!!!! The cashew apple on each tree tastes slightly different too. We recently went to Belize on a short notice family vacation. Belize City is where most people go on vacation in Belize. That is were all of the beach resorts are as well as where the cruise ships dock. We stayed in Spanish Lookout, which is a settlement in the Cayo District of Belize that was settled in 1958 by Kleine Gemeinde Mennonites, and is ~2 hours Southwest of Belize City. We stayed in a guest house on a self-sustaining farm community, in the middle of the jungle. Running water was available but we refrained as we didn’t want to get sick. A toilet, a shower with hot water, and a small kitchen sink were at the top of the amenities list. The girls got to bottle feed goats. Howler monkeys were within a 1/4 mile of our guest house. We attended the Spanish Lookout Commercial/Industrial Expo. It reminded me of the Michigan State Fair, on a much smaller scale. Finally got to see an Amarok in person! We visited San Ignacio, but most of the stores were closed for the day on Sunday. We ended up eating lunch while we were there though. We crossed a river, in a car, on this barge. You can go to the pharmacy whenever you want. No need to go to a doctor and get a script first. We visited our first Mayan ruin. Cahal Pech! They had beer there. Nothing great. Belikin is “the” beer of Belize and is brewed by the Belize Brewing Company. Around mile 25 on the Western Highway, traveling west from Belize City to the Cayo District, “The Sleeping Giant” that guards the foothills of Maya Mountains appears in the distance. We got to board our flight on the runway!